EXTREMELY RARE ISSUE IN ULTRA! It has been at least 2 years since I have been able to offer a 1954 proof Lincoln in ANY grade of ULTRA CAMEO. NGC has only graded 33 TOTAL examples in ALL grades of ULTRA CAMEO. 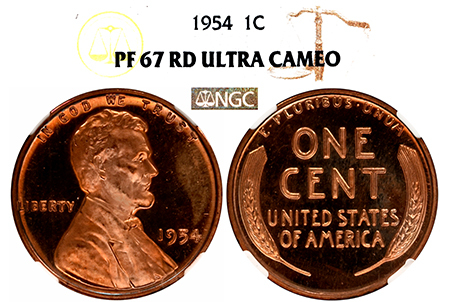 There are 14 examples certified in PF 67 RD ULTRA CAMEO and only 7 graded higher. Finding a wheat back penny without carbon spots is TOUGH! This is a KNOCKOUT example for the date and grade offering incredible snow-white frosted cameo devices contrasted against pristine spot-free, haze-free jet-black mirrored fields.